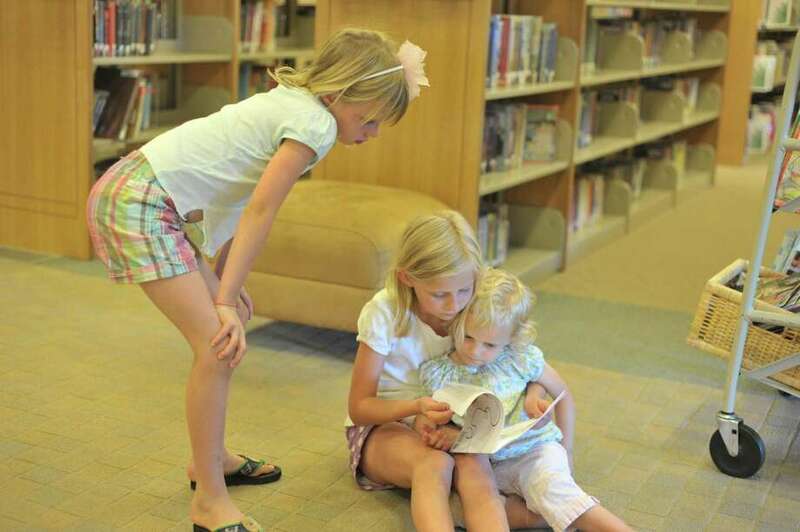 Kate Lane, 9, reads to her little sisters Charlotte, 3, and Avery, 7, at the Darien Library, July 9, 2012. Photo by Henry Eschricht, Darien, Conn. Whether you find them at the beach or in their living room, Susan Daly and her three kids are likely to have books in their hands. "We also have, by our pool area, these hammock chairs that kind of envelop you," Daly said of the family's classic reading spots. "They're lounge chairs. We lounge a lot." The Dalys are avid summer readers, so it's not surprising they also spend their time at the Darien Library. "We send our kids there most of the time to read and do the classes," she said. "My oldest son just got asked to be on the Kids Advisory Board, and I like that because it's another way for the kids to grow up to be readers." Another perk for her son, 11-year-old Quinlan, is that he gets to review advanced copies of books that have not been released to the public yet. "How cool is that?" Daly said. While the advisory board is not summer-specific, the library is active about encouraging summer reading. The theme for children this year is "Set Sail into Summer Reading." Head of Children's Services Kiera Parrott said there will be programs throughout the summer, such as learning how to tie a nautical knot, to get kids in the summer reading spirit. "It's been so popular that, by the third or fourth day of our sign-up, almost all of the registrations were full," Parrott said of the programs. There's no such thing as having too many readers, though. Parrott said there are weekly prizes to motivate all kids to read. One week, a reader won an iPod Shuffle simply by participating in an online quest on the library's website. Readers also have the chance to win the grand prize, an iPad 3, by earning raffle tickets for reading. "When they sign up, they come in and get a `Captain's Log,' which is like a little booklet," she said. "When they get to 10 books, they come and show us ... and we give them a raffle ticket." New Canaan Library has a similar program for teen readers called the Summer Library Exploration and Reading Program, or SLERP. Teen Services Librarian Gretchen Kolderup said 112 teens in grades seven through 12 are currently signed up for the program. "Basically, kids sign up and they keep track of how much time they spend reading," Kolderup said, adding they also keep track of their cultural explorations. These include museum visits, concerts, theatrical performances, historical landmarks and library programs. "If they go to museums and they learn something there, that's something we want to encourage," she said. By reading or attending a cultural event, students earn points toward weekly prizes and a grand prize at the end of the program. Kolderup said the 112 participants have logged a total of 96,787 minutes of reading and exploration so far, which is equal to 67 days. "The idea is that, over the summer, reading enriches your life and improves your test scores when you get back [to school] in the fall," she said. The library also provides copies of suggested reading for students at Saxe Middle School in New Canaan, who are required to read at least one book in the summer. Similarly, Middlesex Middle School requires eighth-graders to read "Out of My Mind" by Sharon Draper. Erica Gauquier, the teen services librarian at Darien Library, said the library has about 50 copies of the book and orders more as students join the waiting list. "I keep an eye on the holds and usually we like to do one book for every three holds," Gauquier said, adding she also reads most of the books the teens are reading, especially ones the library recommends, to make sure they are appropriate. Teens have free reign as to what they are allowed to read from Darien Library's suggested summer reading. "A lot of them are really in to fantasy," Gauquier said. "That's kind of a big trend right now in the young adult publishing world." But requiring summer reading seems to be a thing of the past, according to Rosanne Nissen, events coordinator at Barrett Bookstore, 314 Heights Road, in Darien. "We've always gotten involved with summer reading with the schools and the libraries as well," Nissen said. "And what we've seen that changed is the schools used to have a required list." Nissen said one thing that hasn't changed much, however, is the enthusiasm for summer reading. "Everyone's very enthusiastic and that's the nice thing about it," she said. "The last three weeks of school and the first three weeks of vacation, there's a high level of parents and students coming in." Erin Shea, head of adult programming at Darien Library, called Darien a community of readers. "I find that, for the adults in town, we're of course a very intelligent and erudite town, so reading is already built into their lives," Shea said. The theme of the adult summer reading program in Darien is "Dive Into Something New." "And it's just about how the library is already a destination to dive into new things," she said, adding that readers can write reviews of books on the library's website. "It's been great. We've received hundreds of reviews already," Shea said. Readers don't have to register to get involved in the program, which they had to do in past summers. The program's description on its website says all you have to do is read. This should be no problem for Sandi Duffy. She already participates in library programs like "Meet Us On Main Street," a weekly book chat for readers to share their latest read. She is also an avid reader. "I'm pretty consistent," Duffy said. "I try to do a book a week." So far, Duffy said, she has probably read about eight books this summer. While you might find her at the library, she prefers to slip into a book in her sun room at home when the weather is nice. "I also read when I'm having my breakfast in the morning," she said. "And I call it my breakfast buddy." Even five minutes reading at the breakfast table is enough for Duffy to feel like she's starting her day on a good note, she said, adding, "I'm actually a very fast reader, but I am not able to do more than one book at a time. I would rather speed through a book and stick to one." When Duffy goes on vacation, she said, the amount of time she spends reading increases. "I was on vacation and I was reading like a wild woman," she said.